Casual games are a completely different category on their own. Trying to appeal to a mass audience that has little time on their hands means that the developers need to find a balance between simple and clear game mechanics that are interesting enough so the gamer will be coming back to the game. Developer Blue Giraffe has managed to do that with their time management game Heart’s Medicine – Time to Heal, and even more. Heart’s Medicine begins with the opening scene showing an ambulance running down the road, during a stormy night. Inside, our heroine, Allison Heart and her friend Jenny are doing the best they can to save the life of Daniel, who is a friend of theirs. The ambulance driver is driving fast in order to reach the hospital in time. Unfortunately, a tree log blocks the middle of the road and in a sudden move to avoid it, the ambulance goes off the side of the road and jumps off the cliff. 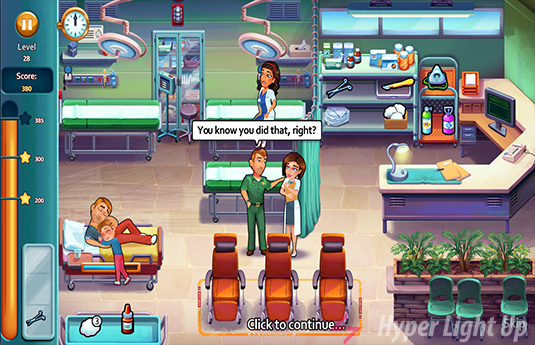 The actual game begins a few months before the incident, when Allison arrives at Little Creek Hospital with aspirations to become a surgeon. Unfortunately there is not a position open for her, so she will have to start from a lower position in the ward and move up, working on the pharmacy, the E.R. etc. 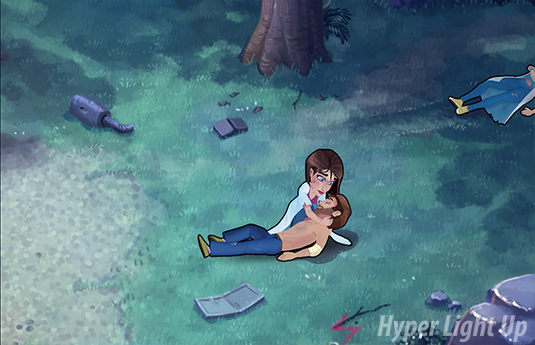 During your playthrough, you will also find out what happened that fateful night after the accident. 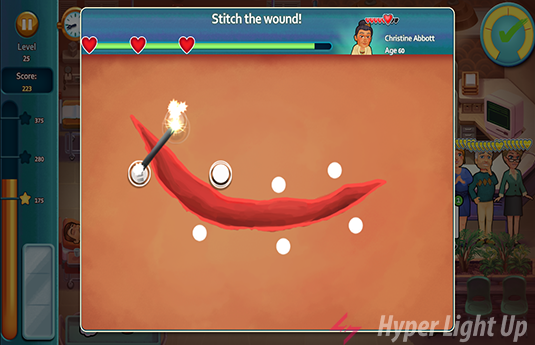 Heart’s Medicine is a time management game and that means the player will have to make fast decisions, showing the patients the correct therapy, treating them correctly, providing them with drugs, reading their x-rays and many more. Some times there will be mini games that require fast reflexes or observation skills. Being fast and precise in the game means that you get more stars from each patient that count up to your final score. The game has 60 main missions, 10 for each position Allison will be working on. 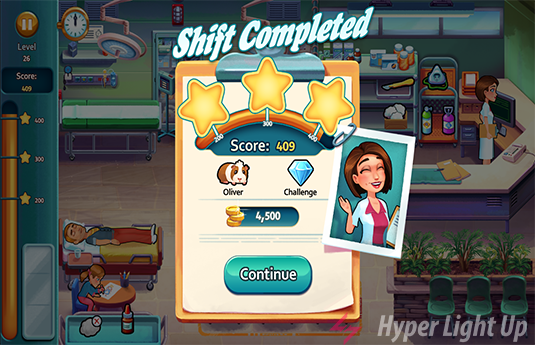 In each of them you will be given some challenges, for example to treat every patient in a certain time limit, to walk an x amount of feet during your shift and many more, that keep the gameplay challenging. In times, new mini games will be introduced that make the game even more interesting. Besides these missions, you will have side challenges that have nothing to do with the main storyline but are nontheless enjoyable and lighten the tone of the story. The gameplay mechanics are pretty polished and I didn’t notice any problems during my playthrough. As far as story goes, I was surprised to find it well thought and interesting, so interesting that it is a big reason to make players want to come back to the game. Now, you need to understand that, it’s not something ground breaking for the gaming world. Heart’s Medicine feels like a romantic medical drama, a soap opera you watch on tv. It can be cheesy, things that you expect to happen, will happen and the characters feel almost flawless (with a few exceptions). All of the above though don’t mean that the story is not good. On the contrary, going in the game with this information, you will find a well written story with characters that you get to like and care about. Personally, I didn’t expect much from a casual game and it was a pretty nice surprise to find something that well made. The personality of the characters is being helped not only from the story, but from the animation and visual style too. They are beautifully drawn with their faces and movements to convey exactly each situation they are in. During my Pharmacy playthrough, I was fixed to Ruth’s face in each cutscene, amazed at how she interacted and reacted to the situations, and at how her animation showed that. Blue Giraffe did a pretty polished work on this respect. The music is just ok, works exactly as it should in a casual game. Unobtrusive but good enough to fill the space while you are playing each stage. In key moments of the game though there are original songs, bittersweet and beautiful, that could definitely find a spot on my playlist for the days I feel blue. I always liked casual games, either because I needed something to chill after a long gaming session with my favorite rpg or, in the recent years, because I don’t have much time to sink into a long game but I still need something fast to entertain me. Heart’s Medicine has given me all of that and more than I expected. The slightly negatives I could find were that, if you go in for a long session you might find the gameplay a bit repetitive. Also, there are some stages that are pretty hard to get 3 stars, something that will affect the perfectionists out there. All in all, I definitely enjoyed my time with it and, if you are a casual gamer with not much time on your hands, I definitely recommend it. You can buy Heart’s Medicine – Time to Heal on Steam for the price of 12,99€. Heart’s Medicine – Time to Heal is a great casual game, with easy to understand mechanics, visual style and animation that brings life to characters and a story that will make you keep coming back. It might feel repetitive after long gaming sessions, but casual games shouldn’t be played in one sitting, should they? Definitely recommended.